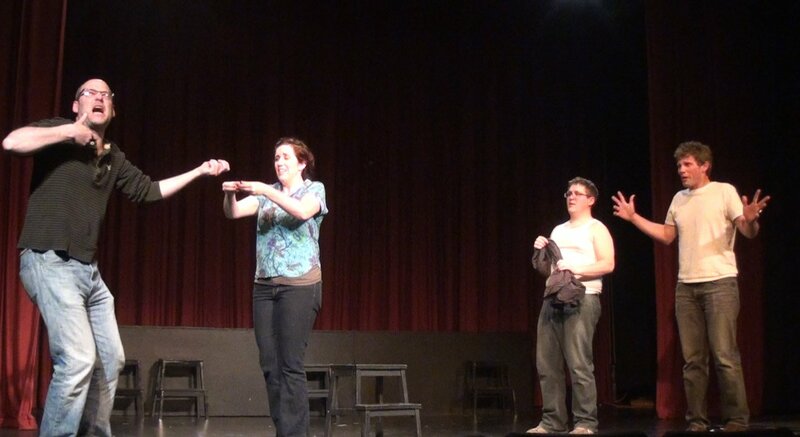 In general, I believe that if you have any fear about where a scene is going in improv, that needs to be explored. It might not make for the best performance in that specific case, but whatever’s learned from pursuing the more difficult direction is something that’s going to make future performances better. Johnstone would probably disagree: “The improviser has to realize that the more obvious he is, the more original he appears. I constantly point out how much the audience like someone who is direct, and how they always laugh with pleasure at a really ‘obvious’ idea.” And I think that’s true… mostly. But if the obvious continues to take the individual improviser to the same choice, over and over, how does the improviser continue to grow? Remember when everyone thought Robin Williams was a brilliant improviser? Until they saw him repeatedly and realized that he continually resorted to the same bag of tricks? Yes, the first time the audience sees that, they love it. Until they see it again. And again. And again. So… while the specific example I used here is about characters killing themselves, my larger point is that it’s important to challenge ourselves to continue pushing in other directions. I’ve found a bit that kills the audience every time? Great, that’s one of my tools. But if I stop there, if that’s the only tool I pull out, I’m limiting myself. That’s as good as I’m going to get. Time to challenge myself to do something besides what I know works. I don’t think Keith Johnstone would disagree with you. I think when he says “the audience laugh with pleasure at a really ‘obvious’ idea” it’s the idea that is “obvious” in retrospect that is funny. For instance, sometimes after one has solved a particularly difficult problem, it seems so “obvious.” But it’s only obvious once you’ve solved it. Same here: in Monty Python and the Holy Grail everyone *knows* the Black Knight is going to have all his limbs severed…but it’s only “obvious” after it’s been set in motion, and afterward it seems like the only possible way it could ever have gone. It’s the process of setting it in motion that is brilliant. Direct doesn’t necessarily mean reaching for the shopworn tool or always talking in cliché or always taking the easiest way. There isn’t much that’s more direct than a haiku, but they are far from cliché unless the ideas in them are clichés. I thought the suicide in Criminal Improv Unit was completely justified; in fact, I thought it was the only possible way that scene would ever go, given the constraints of the genre. But I feel for you: you’re dead a lot on stage, which I’ve also noticed lately. Death *used* to be THE big no-no in improvisation; those around me considered it cowardly and in a sense it was. As E.M. Forster put it in terms of the English novel, everything ended either in death or marriage, so it took a clever mind to breathe life back into death, as it were. And yeah, I agree regarding Johnstone. I took that pretty badly out of context. My most immediate reaction is to the photo with this post. It is sooooooo funny. What is happening in this scene? Left to right: I’m pointing a shotgun at Randy and Chris, as I scream at God; Shira is trying to offer me a sandwich to calm me down; Randy and Chris (both already partially disrobed) are hoping I don’t shoot them. Unless you mean the photo at the top of the page, in which case, Wayne, Lauren, Laura (and I, out of the bottom of the frame) are flies in Zach the frog’s stomach.